File photo of fallen U.S. Army Capt. Humayun Khan and his gravesite. President Donald Trump has signed into law a bill naming a Virginia post office for fallen U.S. Army Captain Humayun Khan, whose father criticized the then-candidate in a 2016 Democratic National Convention speech. The Daily Progress reports U.S. Sens. Mark Warner and Tim Kaine released a joint statement Friday night saying the president had signed the bill filed by Rep. Tom Garrett. Trump had been roundly criticized for his response to Khizr Khan's speech. Khan was 27 when he died in Iraq in 2004. He was posthumously awarded a Purple Heart and Bronze Star. He was the only University of Virginia alumnus killed in Iraq, according to a university plaque. The Republican representative for Virginia's 5th District plans to hold a ceremony for the Charlottesville post office before departing next month. 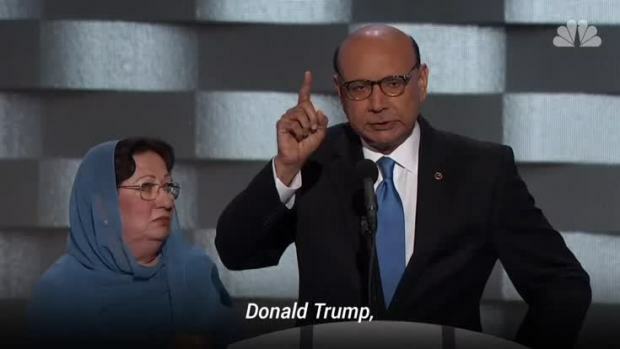 Khizr Khan, the father of a Muslim soldier who died to save the lives of his fellow soldiers, said that Donald Trump had made derogatory statements that smeared the patriotism of American Muslims.